The Android kernel is a powerful ally to the reverse engineer. While regular Android apps are hopelessly restricted and sandboxed, you - the reverser - can customize and alter the behavior of the operating system and kernel any way you wish. This gives you a really unfair advantage, because most integrity checks and anti-tampering features ultimately rely on services performed by the kernel. Deploying a kernel that abuses this trust, and unabashedly lies about itself and the environment, goes a long way in defeating most reversing defenses that malware authors (or normal developers) can throw at you. Android apps have several ways of interacting with the OS environment. The standard way is through the APIs of the Android Application Framework. On the lowest level however, many important functions, such as allocating memory and accessing files, are translated into perfectly old-school Linux system calls. In ARM Linux, system calls are invoked via the SVC instruction which triggers a software interrupt. This interrupt calls the vector_swi() kernel function, which then uses the system call number as an offset into a table of function pointers (a.k.a. sys_call_table on Android). The most straightforward way of intercepting system calls is injecting your own code into kernel memory, then overwriting the original function in the system call table to redirect execution. Unfortunately, current stock Android kernels enforce memory restrictions that prevent this from working. Specifically, stock Lollipop and Marshmallow kernel are built with the CONFIG_STRICT_MEMORY_RWX option enabled. This prevents writing to kernel memory regions marked as read-only, which means that any attempts to patch kernel code or the system call table result in a segmentation fault and reboot. A way to get around this is to build your own kernel: You can then deactivate this protection, and make many other useful customizations to make reverse engineering easier. If you're reversing Android apps on a regular basis, building your own reverse engineering sandbox is a no-brainer. Note: The steps below work on Ubuntu 14.04 with Android NDK 4.8. Personally I'm still traumatized from multiple failed attempts of getting this to work on Mac OS. I recommend taking that route only if you're a masochist - everyone else is better served by using an Ubuntu VM. For hacking purposes, I recommend using an AOSP-supported device. Google’s Nexus smartphones and tablets are the most logical candidates – kernels and system components built from the AOSP run on them without issues. Alternatively, Sony’s Xperia series is also known for its openness. To build the AOSP kernel you need a toolchain (set of programs to cross-compile the sources) as well as the appropriate version of the kernel sources. Follow Google's instructions to identify the correct git repo and branch for a given device and Android version. For example, to get kernel sources for Lollipop that are compatible with the Nexus 5, you need to clone the "msm" repo and check out one the "android-msm-hammerhead" branch (hammerhead is the codename of the Nexus 5, and yes, finding the right branch is a confusing process). Once the sources are downloaded, create the default kernel config with the command make hammerhead_defconfig (or whatever_defconfig, depending on your target device). To enable system call hooking, I recommend adding loadable module support, exposing the /dev/kmem interface, and exporting the global kernel symbols. Don't forget to deactivate strict memory protection as well. Most of these options should already exist in the config file - simply set them to the values recommended below. Set the CROSS_COMPILE environment variable to point to your NDK directory and run "make" to build the kernel. When the build process (hopefully) completes successfully, you will find the bootable kernel image at arch/arm/boot/zImage-dtb. $ adb shell "su -c dd if=/dev/block/mmcblk0p19 of=/data/local/tmp/boot.img"
This should create the files bootimg.cfg, initrd.img and zImage (your original kernel) in the local directory. Then, use the "fastboot boot" command to boot Android with the new kernel. In addition to the newly built kernel and the original ramdisk, specify the kernel offset, ramdisk offset, tags offset and commandline (use the values listed in your previously extracted bootimg.cfg). $ fastboot boot zImage-dtb initrd.img --base 0 --kernel-offset 0x8000 --ramdisk-offset 0x2900000 --tags-offset 0x2700000 -c "console=ttyHSL0,115200,n8 androidboot.hardware=hammerhead user_debug=31 maxcpus=2 msm_watchdog_v2.enable=1"
The system should now boot normally. 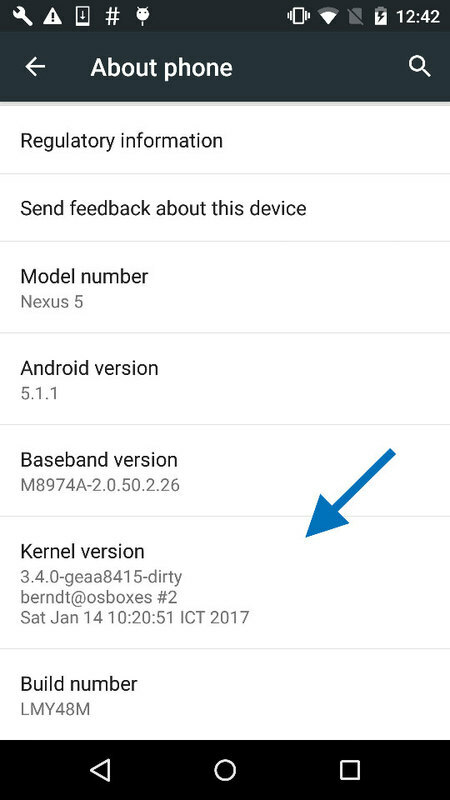 To quickly verify that the correct kernel is running, navigate to Settings->About phone and check the “kernel version” field. If everything went well, this should show the version string of your custom-built kernel. Pat yourself on the back / howl triumphantly, you're now ready for primetime! System call hooking allows us to attack any anti-reversing defenses that depend on functionality provided by the kernel. 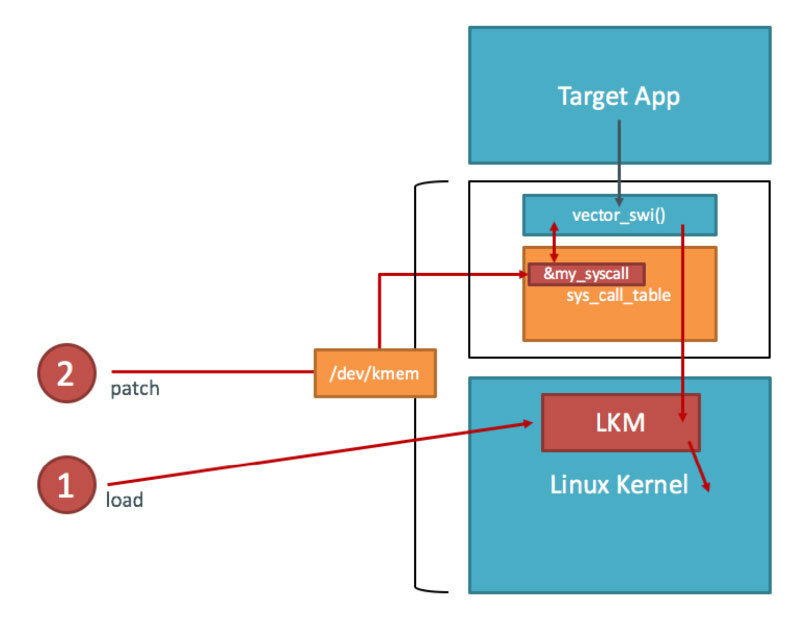 With our custom kernel in place, we can now use a LKM to load additional code into the kernel. We also have access to the /dev/kmem interface, which we can use to patch kernel memory on-the-fly. This is a classical Linux rootkit technique and has been described for Android by Dong-Hoon You . $ adb shell "su -c echo 0 > /proc/sys/kernel/kptr_restrict"
This is the only memory address we need for writing our kernel module - everything else can be calculated using offsets taken from the Kernel headers (hopefully you didn't delete them yet?). Note: Alternatively, you can obtain the sys_call_table address dynamically from within the Kernel module (example). Thanks to LEON for pointing it out. $ adb shell "su -c echo ABCD > /data/local/tmp/nowyouseeme"
Finally it's time to write the kernel module. For file hiding purposes, we'll need to hook one of the system calls used to open (or check for the existence of) files. Actually, there many of those - open, openat, access, accessat, facessat, stat, fstat, and more. For now, we'll only hook the openat system call - this is the syscall used by the "/bin/cat" program when accessing a file, so it should be servicable enough for a demonstration. Run "make" to compile the code – this should create the file kernel_hook.ko. Copy the kernel_hook.ko file to the device and load it with the insmod command. Verify with the lsmod command that the module has been loaded successfully. The final piece of the puzzle is the address of our replacement-openat. Again, we can get this address from /proc/kallsyms. The following command patches the openat system call table to point to our new function. Assuming that everything worked, /bin/cat should now be unable to "see" the file. Voilá! The file "nowyouseeme" is now somewhat hidden from the view of all usermode processes (note that there's a lot more you need to do to properly hide a file, including hooking stat(), access(), and other system calls, as well as hiding the file in directory listings). File hiding is of course only the tip of the iceberg: You can accomplish a whole lot of things, including bypassing many root detection measures, integrity checks, and anti-debugging tricks. You can find some additional examples in the "case studies" section of my recent paper. System call hooking is a useful technique for Android reverse engineers. To use it, you need to build you own reverse engineering sandbox with a custom kernel. This article showed how to do this on a Nexus 5 running Lollipop - the process should be similar for other AOSP-compatible devices.